I have had quite a few great men in my life, but I wanted to share 10 things about my Papa. Great at games, always ready with a smile, fun, dependable, and humble. 1. Hide and seek when you came home from work. 2. The doll house you built me. 3. Riding bikes with you and Nana around the neighborhood. 4. What’s your name? Puddin’ tang. 5. Staying the weekend at your house. And the whole summer. 6. Going to church together. Signing us in. 7. Riding the tractor with you. 8. Being on stage when you were in the audience. 10. How much I knew you loved me. I love you and I miss you still, Papa. 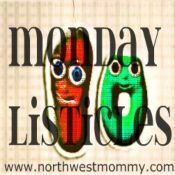 This post is linked up over at Monday Listicles. The prompt? Write about one of the men in your life. Sunday, I was in a foul mood. It started when my Mom called to get help with her computer problems. She was talking to my husband and I kind of lost it. I realized how much both of them frustrate me at times. One tech head. One helpless adult. I started creating some chaos, which wasn’t cool as my husband was on the phone. But, hey, whatever, I was irked. I finally left the room and went into the bedroom where I started crying. Not just any crying – huddled up on the floor hiding between the bed and the wall in the fetal position crying. I wasn’t even sure why I was crying just that something was going on in my head and my world. Maybe it’s because my Mom – who never really seemed to care – likes my husband better than she likes me sometimes. Or maybe it’s because I can’t get him to say a word to me half the time, but he can talk with no problem to my Mom. I had to go to a meeting for another short film I’m hoping to work on, so I decided to leave after I stopped crying. I wanted to get out of the situation and not cause any more trouble or have the situation devolve. I had the meeting for the movie then came back home feeling better, and I was glad that I had decided to ignore whatever crap was brewing in my head. Later that night, we went to a concert with some friends. On the way home, I got a call from my Sister that Mom was in the hospital. She had felt like she couldn’t breath and had pain going up into her jaw on the left side – all signs that she may be having a heart attack. I got through to her room – her cell phone had died – even though the nurse was a bit resistant to put through the call and found out she was admitted overnight. The tests did rule out a heart attack, but something was going on. We had talked to her again right before the concert about another tech issue. My Sister told me it happened a little after that and Mom had instructed my Sister not to call me until after the concert. Only my Mom would have an almost heart attack and not want to bother me in a concert. 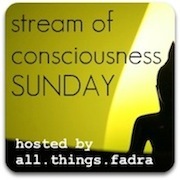 Link up your post at All Things Fadra. This post is linked up over at The Good Life. Go visit and see what others have to say about their home. You all know the old saying. When there’s bad news there’s a lot of bad news. Oh. That’s not the saying? My friend’s Dad is in the hospital in intensive care again. He’s been progressively improving since October when he had a spot that could have turned into an aneurism. He was in rehab, but is now back in the hospital in bad shape. I hate to see my friend so unhappy! This is too much stress. Stress not good. Stress does NOT make anyone a happy camper. Another acquaintance’s husband passed away last week. While, I can’t say that I was ever on the best terms with her, and sometimes even wanted to strangle her for her weird passive-agressive nature, I worked with her for a number of years and know that she was really devoted to her husband. It’s a blow that I wouldn’t wish on anyone. Friend. Enemy. Or frenemy. Last, but certainly not least, my husband’s cousin had a stroke. I found this out while we were waiting for his Dad to go into surgery for his knee. Only 26. Just married. Just graduated and started working as a nurse maybe a year ago. Tragedy. Shock and dismay. A massive bleed. Deep in her brain. First thing I think? It’s almost better that she doesn’t wake up. I think this, but knowing that some people already see me as a cold-hearted witch try to refrain from saying it out loud. I just know that I wouldn’t want to live out the rest of my days unable to move, talk or really do anything. Quality. Of. Life. That’s all I’m saying. These and some other things are the reason I’m saying – enough is enough already. No. More. Bad. News.